Princess Ariel has a date with her prince and wants to be very beautiful. Make up the princess Ariel and do not forget to choose a nice hairstyle. Use the mouse to play this game, clicking on the items you want to place the princess. Click on another to change what you have put and see how you feel the new. Dress and makeup Ariel as best you can to make her look very beautiful!. 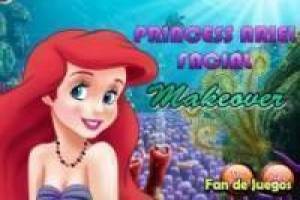 Enjoy the game Princess Ariel: Facial makeup, it's free, it's one of our disney princesses games we've selected.